Lion in the Streets at UVic Phoenix February 12-21, 2015. A review. You are here: Home / Arts / Lion in the Streets at UVic Phoenix Theatre February 12-21 2015. A review. Lion in the Streets at UVic Phoenix Theatre February 12-21 2015. A review. Lion in the Streets at UVic Phoenix Theatre February 12-21, 2015. A review. Twenty five years have not dimmed the provocative power and searing intensity of Judith Thompson’s Lion in the Streets (currently at the University of Victoria Phoenix Theatre February 10-21). Written in 1990 as a heart cry to current events in her Toronto neighbourhood, this dark tale prowls on the edges of human story and experience, digging into corners most would rather leave unexplored. Colette Habel’s brooding sound design immediately sets a mood of disquiet and unease, a portent of the tales to come, and bringing to mind the passage from Genesis “and the spirit of God brooded upon the water”. Isobel (Lindsay Curl) struggles valiantly to free herself from the clutch of individuals surrounding her, her actions reminiscent of a young child stuck behind furniture or attempting manoeuvres beyond her physical capabilities. She’s an outsider, bullied on the school yard for being “other”—a foreigner. Alone, she wanders the streets at night, lost and seemingly invisible to the many adults whose worlds she peers into ever-so-briefly. Curl’s Isobel is brave and courageous, undaunted in her quest to find a way home and confront the lion who prowls. Allan Stichbury’s set oozes muck and mire with sculpted floors and chairs. Rather than recreating a neighbourhood complete with buildings, the designers have collaborated on an extremely effective combination of representational elements. Projections (Bryan Kenney) are reminiscent of a child’s drawings—pulling the audience into a world seen through Isobel’s eyes. Lighting is dark, with narrow slivers of illumination, focusing attention. Costume designer Emma Welsh brings in elements of the period to punctuate the often-monochromatic colour scheme. Rather than a linear narrative, Lion in the Streets presents episodes that appear at first to be unrelated, but gradually, the connections become horrifyingly apparent. Director Conrad Alexandrowicz mines Thompson’s rich text and draws upon deep experience in dance and movement to produce a work that is at once dream-like, intimate and harrowing. The young ensemble, playing multiple roles, confronts horrible realities without flinching in their commitment. Cycles of tension and release—sometimes through brutal and violent means, at others through humour—mount with ever-increasing force until the final redemptive conclusion. Throughout there is great physicality—actors flip sensuously as they dance, and are carried afloat (Sarah Cashin), young boys (Levi Schneider, Logan Mitev) battle one another on the bedroom floor and, in the blink of a eye, become adults bent on destruction, uber-Mom (Zoë Wessler) struggles to impose her viewpoint on other day care parents (to the collective nods of the audience—most will recognize the back story). A young man (Sean Dyer) demands his bride-to-be (Nikola Whitney-Griffiths) prove her love. Throughout, the question arises—what would drive someone to react in that way? Nowhere is this more urgently felt than in the sequence with Wessler, as the reporter Christine, interviewing Scarlett (Arielle Permack), a young woman with cerebral palsy. The encounter is unsettling in the extreme given certain preconceptions about disability—Permack captures the young women’s longing and bravado ferociously. Thompson upends every convention as she niggles for the truth. I was first introduced to the work of Judith Thompson when Theatre Inconnu produced The Crackwalker in 2012. Lion in the Streets leaves me with a similar sense of emotions and being rubbed raw. If the role of theatre and live performance is to “hold up the mirror” and ask the unanswerable questions—to force us to confront the dark desires at the very centre of our beings—then cast and crew have succeeded beyond measure. Lion in the Streets is dark, disturbing, revelatory and illuminating—it demands an audience equally as brave and intrepid. This review deliberately reveals little, in order to allow audience members to reach their own conclusions as to interpretation of events. Subject matter and language in Lion in the Streets is disturbing and may contain triggers. This Chalmers-award winning play is much-studied in universities and has been the subject of scholarly articles and theses. (See below for links to further reading). 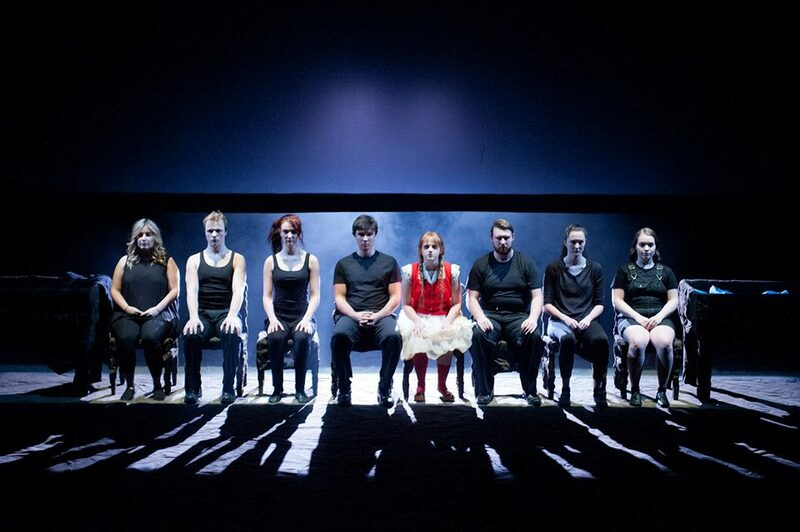 Thanks to the University of Victoria Phoenix Theatre for producing Lion in the Streets and especially to the young actors who so boldly travelled to places of the soul and psyche rather than run in terror as the majority of us would be wont to do. “There’s a crack in everything. That’s how the light gets in.” Leonard Cohen, Anthem. Phoenix Box Office: in person or by calling: (250) 721-8000. Warning: Mature subject matter. Disturbing content and strong language. Recommended for ages 17 and over. This Chalmers-Award winning Canadian masterpiece takes place somewhere between reality and dreams, memories and fantasies. Isobel, a lost Portuguese girl wanders through her Toronto urban neighbourhood, frightened and looking for answers, and witnesses a series of dark moments in the intertwined and troubled lives of several strangers in her community. As Isobel watches these strangers try to hold on to their own humanity, she finds understanding, forgiveness and ultimately redemption.